Four years ago, Dwyane Wade was on the fast track to success after leading the Miami Heat to a championship. The feat was impressive because Wade was only in his third year. More impressive was the fact that he put the entire team on his back and led them to a spectactular comeback to win the ring. For the first time, sports media outlets were questioning if Wade was possibly better than LeBron James. There was a moment in time when Dwyane Wade was getting credit for his accomplishments. 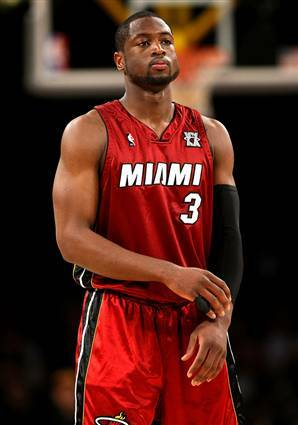 However, the next season would prove to be a test, as the Heat struggled and Wade was injured midseason. The knee and shoulder injuries kept Dwyane Wade out for most of the 2007-2008 season and the Heat posted the NBA's worst record. The next season, Wade redeemed himself, and was the best player in the league. Despite his performance, the Heat continued to struggle, but made the playoffs. Soon, rumors of Dwyane Wade leaving Miami began. Last season, there were times when it appeared as if Dwyane Wade had given up on his Heat. No matter what, they just could not get things right. Wade needed a real team around him because his top rivals, Kobe Bryant and LeBron James, were leading well-rounded teams. The Heat took a risk in the 2010 offseason by unloading their entire roster. But, it paid off when Chris Bosh left an even worse situation in Toronto to play for the Miami Heat. Following Bosh's exit, LeBron James left his league-leading Cleveland Cavaliers to also be a part of the Wade-led Miami Heat. Sports experts said the new-look Miami Heat would easily dominate the leage and win the championship. But, two weeks into the season, the Heat seem to only be able to defeat the weaker teams in the league. Already, the new-look Heat are 0-2 against the Boston Celtics and they have also lost to both the New Orleans Hornets and Utah Jazz, teams they are supposed to easily defeat. Even with this super-roster, Dwyane Wade finds himself in a similar position to the position he holds each season, barely holding on while everyone else dominates.